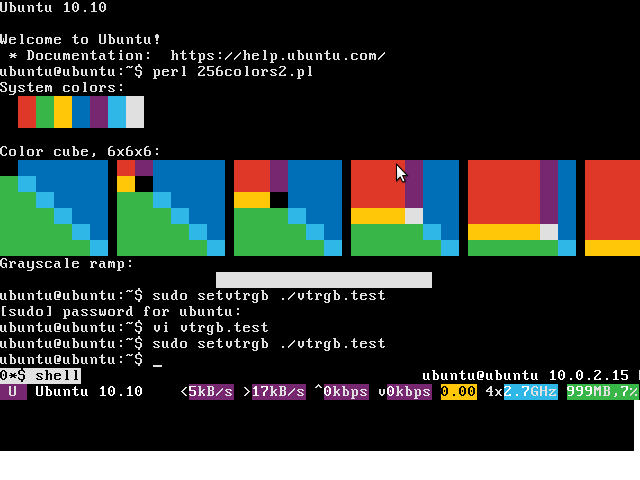 It would be very Ubuntu of us to provide a program in /sbin/setvtrgb that dynamically modifies these colors. Furthermore, we should provide a better default color palette than the standard vga one, allow admins to configure it, and apply it at boot. Eventually (11.10?) we should try to apply the Ubuntu fonts to the console as well. Steps 12–14 are blocked waiting for the Ubuntu Monospace to be released and available in the archive. Adding a well tested, well formed kbd patch. This one should be suitable for upload to Natty. Shouldn't this need an FFe? The font stuff is not intended for 11.04. The color stuff is subject to UI Freeze. Patch for the console-setup portion attached. Closing the cdebconf task. No code is affected there. There is an alternate palette with high contrast colors for accessibility. But if that palette is not selected, the default newt one is. Yes, there are a total of 16 colors -- 8 normal ones, and 8 bright analogs. Marcus selected all 16 for us. The first 8 normal ones are new and distinct to Ubuntu. The latter 8 bright ones he and Ivanka felt that they couldn't improve upon the 8 pure ones, so we've left it at that. The 256color.pl script that I used to create the screenshots wasn't the best way to show these. I found a better script in that x329.html document. Any idea why we don't have colours in the default setup? Are these also going to be the default gnome-terminal colors, or available as a palette there? They look similar to what comes up under "Custom" but I don't know if that's just me. Team) inspired these which are used on the console. Thanks! > Any idea why we don't have colours in the default setup? seeing it... What "default setup" do you mean? We are carrying a small patch in Ubuntu that makes Newt's default color palette configurable, by optionally placing a configuration file at /etc/newt/palette. If no file exists at that path, then newt's operation proceeds as normal. If, on the other hand, a file does exist at that admin-owned location, a list of color values is read from that file and overloaded into the newtColors struct and set with newtSetColors(). I've tested it pretty well and seems to work quite nicely here. Please consider committing this patch against your upstream newt branch. Thanks. I had previously marked the cdebconf task 'invalid'. That was incorrect. It took a while to shake out, but Colin recently rebuilt debian-installer, which pulled in a number of changes since the previous d-i build. In particular, the changes to newt that made this behavior configurable landed in the meantime. When d-i rebuilt against this newer version of newt, the aubergine newt palette dropped out of the installer. I have a solution to this problem, which will in fact make this palette *totally* configurable for downstreams too. The changes will land in cdebconf. Attaching a patch here, for posterity. I'll look for the appropriate reviews and beta bug fix approvals ASAP. Note that this cdebconf upload requires release team approval. I have discussed this in IRC with Colin. He okay'd me to go ahead and upload now, and queue the upload for beta2. He will need to rebuild debian-installer to enable these changes before building Beta2 ISOs. Pushed cdebconf changes to bzr+ssh://bazaar.launchpad.net/~ubuntu-core-dev/cdebconf/ubuntu. Uploaded cdebconf_0.154ubuntu2 to the Natty Beta2 queue. So we should be able to drop the patches to kbd once upstream releases, Debian merges, and we sync with Debian again! Instead of requiring all 44 colors on one line I think it would be better to specify color of each item separately. For items which are not specified in the config the default would be used. - the default path should be configurable in the configure script, /etc/newt/colors by default? I can look into it if you want. Awesome! Thanks for the response. I was worried this bug/patch might have gotten dumped into the bit bucket. Regarding the format of the file, I just went for the simplest approach, from the perspective of reading the values in the C code. I didn't expect this to be something that people changed often, frequently, or on their own. I expected more that a distro or a packager would do this, and probably only ever do it once or twice, so I didn't really think about it in terms of a user-friendly interface, but instead, just as a "functional" one. Regarding the default path, yes, of course, that could (and should?) very well be configurable. /etc/newt/colors seemed to me like a simple, straightforward, obvious default. Regarding a "NEWT_COLORS" environment variable, that's an excellent idea, such that the color scheme could even be modified on an application-by-application, or process-by-process basis (rather than system wide). I'm concerned a little bit by the complexity of the code necessary to process the descriptive configuration file and/or environment variable. At this point, I would prefer for you to point me to a git branch with your implementation of these, and I'll gladly build/test that, and port over Ubuntu's use of this functionality to your new implementation. Ok, I've pushed a patch implementing that to git (git://git.fedorahosted.org/git/newt), please let me know how it works for you. How do the colours compare to the http://ethanschoonover.com/solarized ? Are there goals to have these color pallete availablle via gnome-terminal, emacs, vim, dircolors, source-highlight, eclipse, gedit, etc..... ? I'm currently using solarized and I truly love well designed colors across all of my monospace activities.